Custom Engineered for safety and max uptime. The larger the project, the more complexities, the higher the requirements, the more stringent the safety standards. These types of projects require a customized Burner Management System. Industrial Dryer systems can span several markets such as Pulp & Paper, Food Processing, Pharmaceuticals, Nonwovens, Automotive, Cement, and Textiles to name a few. These larger BMS applications range from Yankee dryers, Thu-air dryers, Rotary dryers, Fluid Bed dryers and Bonding type dryers. A properly designed custom PLC based Burner Management System (BMS) will reduce downtime, meet or exceed current industry safety standards, offer intuitive controls for operators, fail to a pre-determined safe state and has proven to keep overall burner ownership costs down for years. Why Buy A Custom Built BMS? Every BMS must fail to a safe state when conditions exist that make it dangerous to for the burner to either light off or remain lit. The customized PLC based BMS differs from the hardwired BMS systems by offering the owner the flexibility to expand the purge & safety interlock chains with the added ability to either collect, communicate or control other related sub-systems such as the Combustion Management System (CMS), Air Handling System (AHS) and Distributed Control System (DCS). A customized PLC based BMS monitors safety related devices & instruments with increased reliability due to the way the PLC tests the connectivity to each device up to it’s I/O point. The most important performance criteria the custom PLC based BMS exhibits is the ability to fail-safe every time. A final aspect of a custom Industrial PLC Based BMS panel from Results Engineering can involve hosting the Combustion Management System. 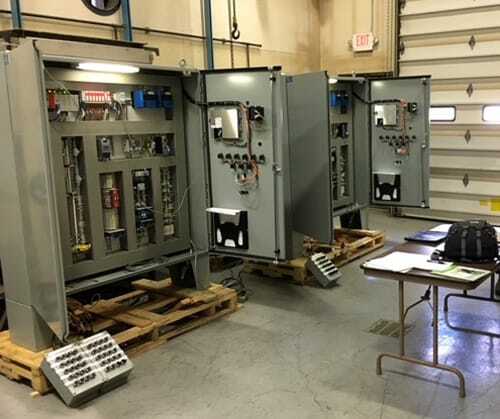 We often provide everything from simply mounting the burner manufacturer’s CMS in our cabinet to save an enclosure and associated field wiring, power drops, etc., to running the fuel/air ratio curves in our processor. No matter what the PLC configuration is the most critical performance criteria the custom PLC-based BMS exhibits is the ability to fail-safe every time. A customized PLC based BMS systems that help maintain high levels of equipment readiness take advantage of industrial plc’s ability to safely control/monitor the purge and ignition process for proper burner operation. For example, a customized BMS has the ability to ensure a proper purge time has been met, detect first outs in the running interlock chain, perform leak checks on gas blocking valves before lighting off, track burner performance all while enunciating system status thru communications to a DCS as needed. These features add to reliable long-term operation of the burner which ensures maximum system uptime during production. Any new customized PLC based BMS design can take advantage of industry safety PLC platforms specifically designed produced and tested to meet or exceed stringent industry standards. An engineered customized BMS will utilize components that strictly adhere to NFPA 54, NFPA 56, NFPA 86, IEC 61508 standards as well as the authority having jurisdiction (AHJ) norms and best practices. All hardware and software selected for a customized BMS are required to meet the same level of SIL ratings to ensure safe & proper burner operation. Standards outline proper methods which define how safety related routines in the Safety PLC program can be modified and implemented preventing On-Line modifications to logic or fail to a safe state if the processor fails. The latest standards aid the PLC based BMS designer to apply the latest tested methods and criteria to ensure long term reliable safe operation thru the life cycle of the BMS. A major reason to customize a BMS is to leverage technology safely to operate the dryer’s burner safely in the most efficient way possible. By reliably displaying purge times, failing to a safe state, enunciating alarms, provide process burner related historical data such as leak pressure, valve cycle times, valve open closure counts the engineered customized BMS will remain in service for long periods of time. Thus, the overall total cost of ownership is significantly reduced. A distinct advantage of a customized BMS is the designer can display meaningful concise information to operations staff regarding burner performance in real time. Intuitive controls, such as on / off, purge time, purge hold and first outs are standard but when also coupled with trends that present historical data for flame strength, valve cycle times and leak check pressure data present a comprehensive display for the owner and their operations staff. Intuitive screens present clear controls and performance related data in way that reduce the need for extensive training and limit costs in the most effective way possible. 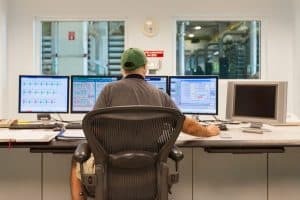 Results Engineering focuses on designing and commissioning burner management systems to safely operate industrial burners within the latest standards and regulations for all major industries. There are many companies and manufacturers that provide Burner Management Systems that are hardwired and offer limited fault enunciation which we consider to be “off the shelf” black box with a limited capability to address a customer’s specific needs. We design systems that fit your specific needs, safely, effectively and offer value-added performance. With 30 years of experience, breadth of expertise and certified engineering team allow us to offer tailored burner management control systems for any industrial dryer in any industry.